This is a story in two volumes, focussing on Caroline Bingley, after the events of Pride and Prejudice. After P&P I didn’t have strong feelings either way on Caroline. Although I am by no means her biggest fan, in P&P her biggest crime is being a social-climbing snob. For all we know, she may have genuinely felt that Jane didn’t care for Charles Bingley and been saving her brother from unwittingly making a marriage of unequal affection. I feel that Caroline was one of the characters who had a comeuppance in Pride and Prejudice, which was to see Mr Darcy get married to Elizabeth, and to be fair, Caroline actually swallows her pride and pays off ‘every arrear of civility’ towards Elizabeth and tries to make things up with Jane. 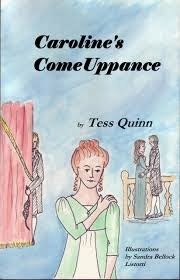 Often in Austen-inspired stories Caroline is portrayed very harshly, so I was interested to see what type of comeuppance the author here had planned for her. Volume 1 deals with the time before Charles and Jane marry. Caroline comes in to Hertfordshire at her brother’s command; he wants her to show support for his marriage. However, Caroline has another agenda, realising that this is the last chance she would have to stop Fitzwilliam Darcy from marrying Elizabeth. In this story, Caroline genuinely loves Mr Darcy and she feels that she almost deserves him for all her years of diligence in attending to her lessons in being a proper lady. You would think that this would engender the reader’s pity for her, but it doesn’t because she is so unlikeable, clueless and ruthless in her approach to trying to break up the relationship. Obviously her scheming doesn’t come to much and after a run of embarrassments she comes to realise that her perceptions of people were shallow in the extreme. This volume was pretty good, it got the emotions going, even if it was mostly negative feelings towards Miss Bingley! Volume 2 is quite a bit longer. Here we see Caroline after the weddings. She is now in London, living with her brother and Jane. The story begins with Caroline leaving an evening event alone and getting caught up in some intrigue. She gets abducted by somebody calling himself only ‘Sir’ who later turns out to be a spy. Following this meeting Sir contacts her again and Caroline agrees to go on adventures with him. I had a few issues with this volume. Firstly, societal norms of the time – I don’t think that Caroline would have left an event unescorted, and I certainly don’t think that as a woman, particularly an unmarried woman, she’d have stayed in London alone when her brother and his wife went to visit Hertfordshire. Going off unescorted with Sir (aside from the initial abduction, which she obviously has no control over) would have been so risky that I don’t think Caroline would have done it. As a social climber of many years standing the risk would have just been too great. Secondly, the relationship with ‘Sir’. I don’t buy it. What on earth he sees in her aside from her physical charms is a mystery. It is obvious that he sees her flaws, but Caroline in this story has no good points in her character. Since ‘Sir’ is a spy he might find some of her manipulative societal skills useful but how that would serve them in a relationship when they are not out in society is less clear. There was an aspect of this story that I found a real shame, and that was that we see little to no development of Caroline’s character, she begins the story as a manipulative, unpleasant woman, and that is how she remains, and she is rewarded for it. I think Caroline was an intelligent woman who could have either found somebody to care for and potentially soften her attitudes, or she’d meet somebody who would have advanced her in society and she’d become a society wife, but in this latter scenario I don’t see how her husband could care for her at all unless he was unaware of her true nature. Here she is cemented in her awfulness but with the love of an intelligent, decent man who knows what she is and it just seems quite unlikely, and pretty sad for him to have knowingly made such a bad bargain. I also felt that this second volume didn't flow that well, there were a number of flashbacks which I feel interrupted the timeline. I much preferred the first volume to the second.